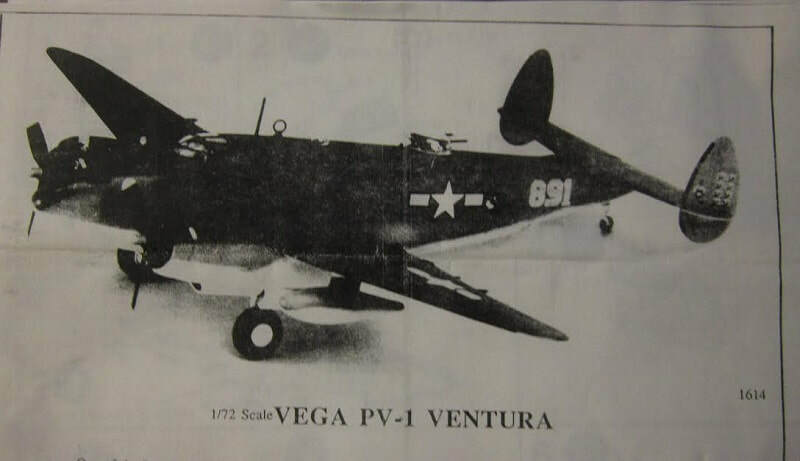 The PV-1 Ventura, built by the Vega Aircraft Company division of Lockheed (hence the "V" Navy manufacturer's letter that later replaced the "O" for Lockheed), was a version of the Ventura built for the U.S. Navy . The main differences between the PV-1 and the B-34 were the inclusion of special equipment in the PV-1, adapting it to its patrol bombing role. The maximum fuel capacity of the PV-1 was increased from 1,345 gal (5,081 l) to 1,607 gal (6,082 l), to increase its range; the forward defensive armament was also reduced for this reason. The most important addition was of an ASD-1 search radar. Early production PV-1s still carried a bombardier's station behind the nose radome, with four side windows and a flat bomb-aiming panel underneath the nose. Late production PV-1s dispensed with this bombardier position and replaced it with a pack with three 0.50 in (12.7 mm) machine guns underneath the nose. These aircraft could also carry eight 5 in (127 mm) HVAR rockets on launchers underneath the wings. The PV-1 began to be delivered in December 1942, and entered service in February 1943. The first squadron in combat was VP-135, deployed in the Aleutian Islands in April 1943. They were operated by three other squadrons in this theatre. From the Aleutians, they flew strikes against bases in Paramushiro and Shimushu, Japanese islands in the Kurile chain. Often, PV-1s would lead B-24 bomber formations, since they were equipped with radar. In late 1943, some PV-1s were deployed to the Solomon Islands as night fighters with VMF(N)-531, a Marine Corps fighter squadron. This kit was willed to me by a friend that died of cancer years ago. I assume it was in a box originally. However, a study of the instructions in the bag for the Academy kit show that the parts trees illustrations do not match the ones in the bag. However, this could be a re-boxing of the Academy kit where they altered the parts arrangements on the trees. Also, the fuselage halves are off white where the rest of the trees are medium-grey? 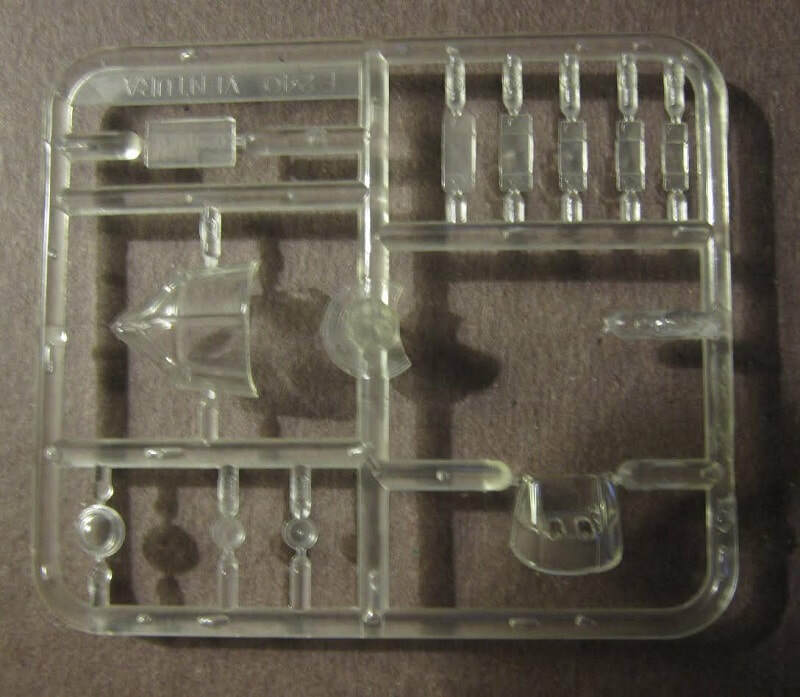 Looking into the origins of the kit it appears it was originally molded by Frog with the molds eventually finding their way to the Russian company Donetsk who marketed the kit with the decals in the review. The Frog kit number was F240 and appears on all of the trees. The trees are not alphabetized. The second medium-grey tree holds: elevator halves, bomb bay doors, machine guns, cockpit floor and rear wall, 3 disc shaped parts (not shown in the instructions). 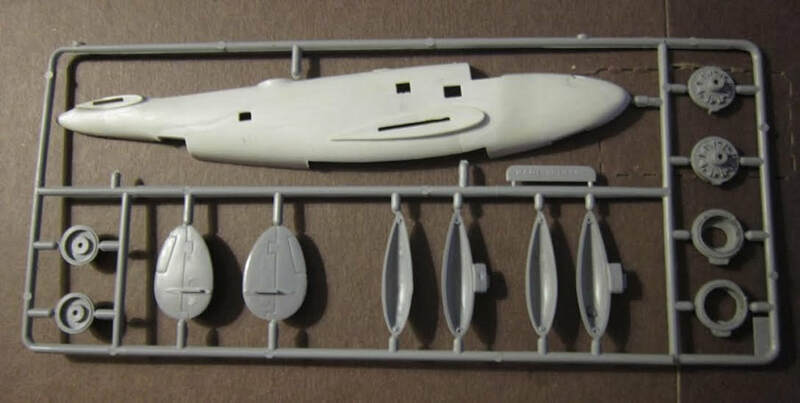 2 white fuselage halves for which I am not certain if they were from the kit originally or another manufacturer. ​The fourth medium-grey tree holds: the other wing''s halves, gear legs, seat, twin machine guns etc. (12 parts) This tree also has a tab on it saying F240. The instruction call out this kit no., but the parts trees illustrations differ from the trees. 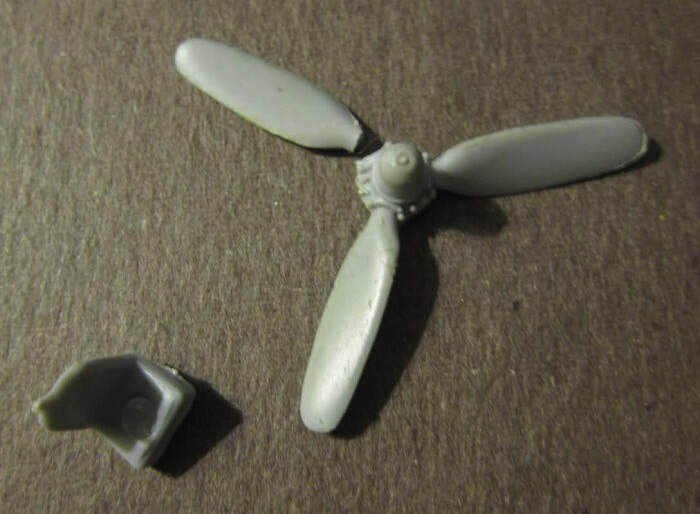 The second propeller and crew seat were loose in the bag. ​The clear cockpit windows etc. are next (12 parts) It has a tab on it saying F240 also and it does not match the parts trees illustrations but dose match the Frog/Donetsk parts trees. ​The instructions consist of 3 Xeroxed pages in 8 1/2" x 11" format, each printed on one side. Page 1 has a black and white photo of the model made up in a U.S. scheme that is not included on the decal sheet that is in the bag. This is over the history of the Ventura and the parts trees illustrations. Page 2 and 3 give a grand total of 10 assembly steps. ​The decal sheet has markings for a French Air Force and a Royal Australian Air Force Ventura on it. No marks for the one shown on the instructions with U.S. markings ? 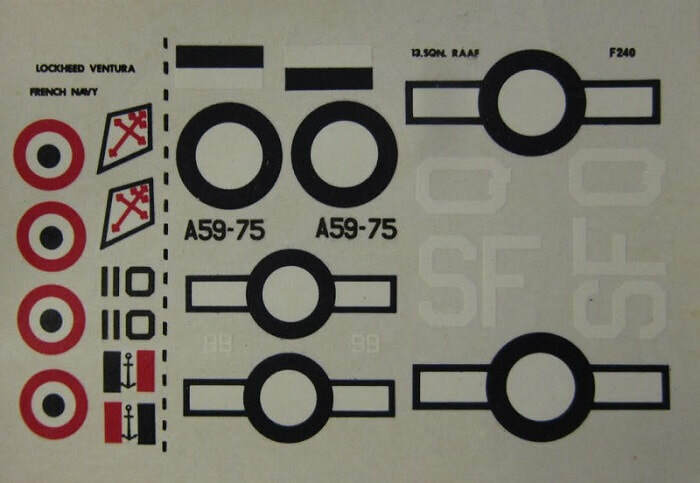 The origin of this decal sheet is most likely from the Donetsk kit. ​This is one mixed-up model and kind of a head scratcher. Otherwise good detail and recommended.